The 1994 Drum Corps International World Championships headed to Foxboro Stadium outside of Boston. 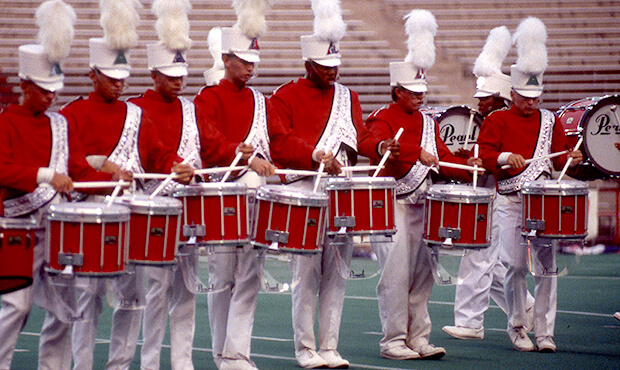 For the first time in history, none of the marching corps members in 1994 had yet been born when DCI held its first World Championship in 1972. Also highlighting the summer of ?˜94, Magic of Orlando became a finalist corps for the first time. With "My Spanish Heart," the Blue Devils became the first undefeated corps since 1982, while the silver-medalist Cadets of Bergen County returned to familiar themes with a reprise of "West Side Story." Colts earned a spot in the Finals competition for the very first time in 1993, finishing in 12th place. Duplicating that position a year later was the corps' production, "Relations and Romance." Though the show was about love, it didn't tell a particular love story, but rather sought to convey the spirit and joy of being in love. The show started with a short and brash fanfare based on "Smile," composed by famed silent film actor Charlie Chaplin. Starting in the form of a giant heart, the production was conceived to set up the anticipation of meeting someone for the first time. The song, which would return at the end of the show, originated in the soundtrack for Chaplin's 1936 silent film "Modern Times," about the struggles of living in an increasingly industrialized world. John Turner and Geoffrey Parsons wrote lyrics for the tune in 1954 and it was made famous when sung the same year by Nat King Cole. The next piece of music was Frederick Loewe and Jay Alan Lerner's "Almost Like Being in Love," sung by David Brooks and Marion Bell in the 1947 Broadway musical, "Brigadoon." The musical became more popular after it was made into a film musical in 1954, starring Gene Kelly and Cyd Charisse. Colts treated the song in a heavy swing fashion, accompanied visually by white flags with red hearts on them. Next came "Lover Man (Oh, Where Can You Be? )," written by Roger (Ram) Ramiriz, Jimmy Davis and James Sherman in 1941. Usually just known as "Lover Man," the piece was composed for and made famous by American jazz singer Billie Holiday, whose version was inducted into the Grammy Hall of Fame in 1989. More people today perhaps know the song for the version Barbra Streisand recorded for her "Simply Streisand" album of 1967. The corps' production focused on the femininity of the color guard, starting with a brief baritone solo and then working into a big brass statement. The color guard utilized blue flags on poles that were twisted into a loop, allowing the members to put their heads through the loops and spin around with the flags trailing their bodies. A drum feature titled "Pursuit," which was written by Colts arrangers Jerry Carpenter, Michael McCray and Kevin Tabb, treated the brass players as the masculine love interest. They teased the female guard members by tossing flags to them over the heads of the drummers and passing through the guard's drill forms, but not stopping to make a connection. "Your Love Keeps Lifting Me (Higher and Higher)" demonstrated the extreme level of volume the Colts horn line was capable of producing. Written by Gary Jackson and Carl Smith, it was originally performed by Rhythm & Blues singer Jackie Wilson in 1967, hitting number one on the U.S. Billboard R&B charts. Herman Hupfeld wrote "As Time Goes By" for the 1931 Broadway musical, "Everybody's Welcome." It didn't become a massive hit until the Dooley Wilson character of Sam sang it while performing inside Rick's Caf?© Am?©ricain in the 1942 smash hit feature film, "Casablanca," starring Humphrey Bogart and Ingrid Bergman. Colts slowly built the gentle ballad into a big stationary climax, with a man and woman finding one another. The production ended with two circles of interlocking horns, representing two people coming together as one?”an image often seen in jewelry. The show ended with corps arranger Chuck Naffier's "Reprise 1994," based on "Smile." The affirmative music proclaimed that everything was going to be just fine, in a happily-ever-after sort of way. For this week only, you can save on the Legacy Collection DVD that contains this complete Colts performance, along with all finalists from the 1994 DCI World Championships. Buy the 1994 Legacy Collection DVD. Discount DVD offer ends Monday, April 13, 2015.